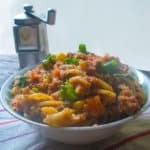 This is how I make the wheat pasta with mutton mince and vegetables option for dinner in the Ramadan Weight Loss Diet Plan. It's tasty and healthy! In a nonstick frying pan, heat 1 tbsp olive oil. Add the 1/2 cup mixed vegetables. I use frozen to save time, but you can use fresh if you like. Lightly fry until cooked through. Add the cooked minced meat and fry for about a minute. Add the tomato puree and cook until the raw smell of the tomato goes away, usually about 2 minutes. Season with salt, black pepper, thyme and oregano. Toss together with whole wheat pasta.